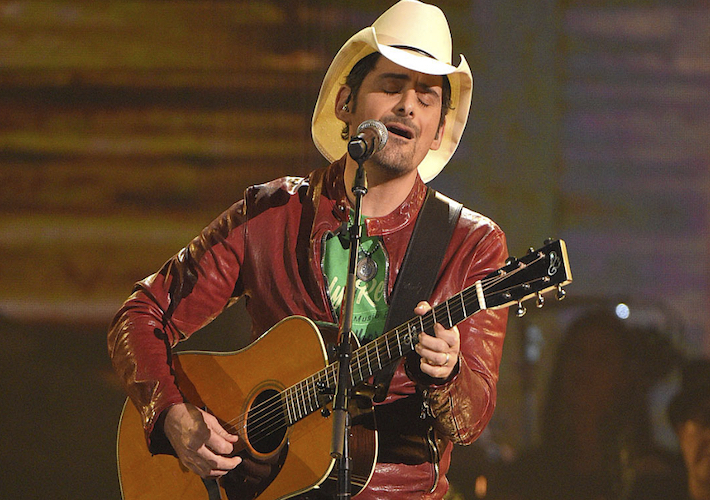 Brad Paisley is a critically acclaimed singer, songwriter, guitarist and entertainer whose talents have earned himnumerous awards, including three GRAMMYs, two American Music Awards, 14 Academy of Country Music Awards and 14 Country Music Association Awards (including Entertainer of the Year), among many others. He has been a proud member of the Grand Ole Opry since 2001. Paisley has written or co-written 20 of his 23 #1 singles with the first being his 1999 hit “He Didn’t Have To Be” and his most recent, “Perfect Storm,” from his chart topping 2014 album Moonshine in the Trunk. Paisley’s current single is “Crushin’ It” from the same album and Paisley will kicked off his Crushin’ It World Tour the middle of May by playing to over 50,000 fans. Paisley has recently partnered with Boot Barn® and developed an exclusive line of jeans, hats, T-shirts, jewelry, belts and woven shirts called Moonshine Spirit by Brad Paisley.